Appetite by Random House, 9780147530813, 344pp. When does the festive season begin for you? For Anna, it's with the first pumpkin pie of the year. Pumpkin pie isn't something she bakes on any old evening, so it signifies something very special when she does: the start of the holidays! In Anna's house, the holidays are a time for coming together with family and friends, celebrating traditions, and making some new ones, too. 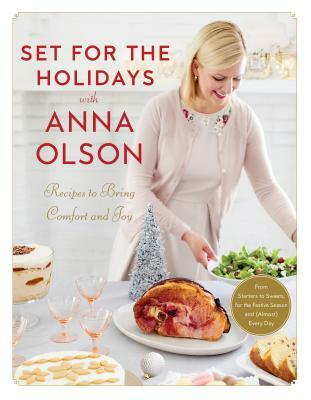 In this festive cookbook, Anna shares the recipes she most loves to make during the holiday season--for occasions like a festive brunch, entertaining a crowd, a cozy supper, Thanksgiving and Christmas dinner, an elegant New Year's evening--and sensational sweets such as holiday cookies, celebratory centerpiece cakes, festive pies and tarts, fancy bars and slices, and much more! With every recipe is a spoonful of practical and supportive advice, including menu planning, make-ahead preparation, and hundreds of other hints and tips. Set for the Holidays will help add sparkle and take away stress from your holidays, so you can navigate the season with confidence! Anna Olson is the internationally-known host of the Food Network's Bake with Anna Olson, Fresh with Anna Olson, and Sugar, and the author of eight bestselling cookbooks on baking and cooking, including Bake with Anna Olson. Anna is a professionally trained chef and pastry chef who lives in Ontario, Canada, with her husband, Michael.